THE European Union (EU) says the army and traditional leaders, accused of lacking neutrality in elections, should make public statements declaring their commitment to upholding the Constitution and accepting the will of the people. EU ambassador to Zimbabwe Phillipe Van Damme on Monday told a local radio station that public statements by the military that it will stick to its constitutional obligations will help build confidence in the country’s electoral system. “It’s not only the voters’ roll that helps with confidence building, a small example, which maybe provocative and I am doing this on purpose, we have heard this call for peaceful elections as well as the impartiality of various actors in the process like civil servants and traditional leaders. “I would like to see, as an observer, that all major stakeholders, whether they are the political leaders, traditional leaders, the security forces and churches that they all stand up and make a formal plea for peaceful elections,” he said. “And that those who have in the past been accused of not being neutral, where they were supposed to be neutral, that they stand up and make a formal public plea to all the others that they will respect their constitutional obligations. Zimbabwe’s securocrats have been accused of meddling in the country’s politics in support of Zanu PF, epitomised by the infamous “straight jacket” statement on the eve of the 2002 presidential elections. Then army commander, Vitalis Zvinavashe, flanked by other senior military and security officials, issued a statement declaring that they would not salute “any political leader without liberation war credentials” in what critics say was meant to torpedo the late MDC-T leader Morgan Tsvangirai, who posed the greatest threat to former President Robert Mugabe’s rule. Since then other top military officials have waded into politics, culminating into Mugabe’s ouster last November. The opposition have in the past few weeks also claimed that the government has deployed military personnel in rural areas ahead of elections later this year. But Foreign Affairs minister Sibusiso Moyo said the country’s military will only be there to guarantee the security of the vote “and make sure everyone accepts the people’s will”. “The military has already made that statement to the Sadc (pre-election) observer mission that was in the country recently that it is not its responsibility to interfere with elections, but expect everyone to respect the people’s will,” he said. Van Damme yesterday said the EU has made the request to the government, but would not discuss (President Emmerson) Mnangagwa’s response. “Yes, we have made this request. 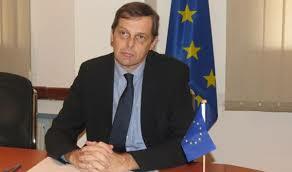 We are in dialogue and we have to respect the confidentiality of our discussions,” the EU envoy said. Van Damme, however, said he was happy with the progress Zimbabwe has made since the change of government last November. “We need to find ways to continue with the confidence building measures beyond the legalities in order to make the elections credible,” he said.